The first mill was established in 1928 by Efstratios Evgeniou in New Triglia of Chalkidiki and it worked like a mill grinding, at first, hard wheat and later soft. In 1953 the mill was expanded with French stones. In 1959, the building was extended with the conversion of a mill with six cylinders. The mill continued to grow by making two new extensions in 1968 and 1979 to increase production and improve the quality. 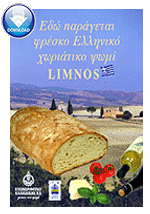 The company in the 70's has entered a dynamic path, and distributes its products in Greece and also deals with exports of flour and agricultural products. Evgenios Evgeniou, in 1981 expanded the company by building a silo with the capacity of 20,000 metric tons with a modern drier in Elaiohoria Halkidiki. In 1987, the company manufactures modern new building with modern processing corn mill, with a total capacity of 200MT / 24 hours, which produces flour and corn meal with low fat, high-quality, handing out internal and external markets and the prospect of new plants to place a new flour mill and a new meal mill for soft and hard grains. In 1988 began the construction of two warehouses with a total capacity of horizontal 8.000MT adding automatic rentler for the transportation of bulk products, completed in 1989. In our modern new facilities in 1993 at Elaiohoria began the construction of the new electronic flour mill total capacity 250M.T. grains per 24 hours and, within a year, it finished and started production, a real gem factory for flour mill. In 1995 began the construction of a modern flour mill and meal mill of hard wheat total capacity of 120MT / 24h, completed in late 1996. In addition, from 1995 our company has the exclusive rights to use and sell in the Greek, Cypriot and Balkan market, the Danish ready-mix & bread improvers of the Danish company Karin of Denmark sa, a company with the largest European range in the prepared mixtures and bread improvers, produced from natural raw materials and minimum fat and sugar. The Karin of Denmark, the Valsemollen sa, the FINAX sa, the companies are KOBIA Nordic group ABDON MILLS, principally engaged in food production and expand its activities in Europe and America. ELOT certification to ISO22000:2005 for the Production & Trade of flours, Semolina & Maize Grits. Efstratios Evgeniou becomes President and CEO of Chalkidiki Flour Mills sa.